Jets' Ryan talks like a movie character at times, can you tell? Published: May 2, 2011 at 09:02 p.m. 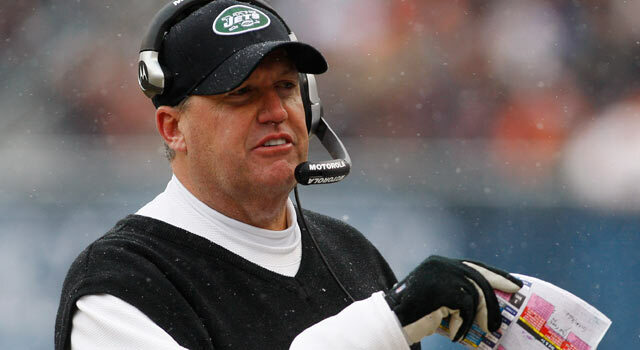 Jets coach and new author Rex Ryan wasted little time sharing his opinions when he was first hired as coach in January of 2009. Ryan made reference to new president Barack Obama during his introductory press conference, saying that he figured to make a trip to the White House in the near future. Of course, some might call that sharing his opinion, others might say that he was shooting his mouth off. But at least he's never dull. In fact, he seems almost like a movie character. And with that in mind, here are 12 quotes -- some from Ryan, some from fictional coaches. Can you tell which is which? 1. "I'm confident. There is no question about it. We're going into the game expecting to win. I'd be shocked if we don't. Absolutely would be." 2. "I just build our guys up. If it's trash talking that I believe in our football team, then, yes, I agree with that statement. I'm the biggest trash talker there is. I don't disrespect anybody else. I just have confidence in our football team. I don't mean to be disrespectful at all to opponents." 3. "You know what separates the winners from the losers? Getting back on the horse after getting kicked in the teeth." 4. "I was just going to come in and be myself and hope that the organization and the coaches and the players and everybody else realized that's who I am. If you can go to work every day with a smile on your face, you're probably successful." 5. "You take this helmet, and you put it right in his numbers, okay? Drive it through his guts. I want to see nothing but snot bubbles in his nose." 6. "You know, when you were a baby in your crib, your father looked down at you, he had but one hope -- some day my son will grow to be a man. Well look at you now. You just got your (expletive) whipped by a bunch of (expletive) nerds." 7. "But to me we should be favorites. I mean in the whole tournament. I think we have the best defense; I know we do. I think we have the best rushing attack. If I had a choice to coach any team in this tournament, I would choose this one." 8. "If you take a swipe at one of ours, weâll take two swipes at one of yours. Weâre going to turn the heat up, weâre going to let the fur fly, and letâs see what happens." 9. "There are three rules that I live by: Never get less than 12 hours sleep; never play cards with a guy who has the same first name as a city; and never get involved with a woman with a tattoo of a dagger on her body. Now you stick to that, and everything else is cream cheese." 10. "If this wasn't friggin astro-turf, I'd dig a grave for myself." 11. "Now I can't do it for ya, I'm too old. I look around, I see these young faces, and I think, I mean, I've made every wrong choice a middle-aged man can make. I've pissed away all my money, believe it or not. I chased off anyone who's ever loved me. And lately, I can't even stand the face I see in the mirror." 12. "I donât know when Iâm going to beat him, but I want it to be Saturday night. Is it personal? Yes, itâs personal. Itâs personal against him." Ryan: 1, 2, 4, 7, 8, 12; Movie: 3 (The Replacements), 5 (The Program), 6 (Revenge of the Nerds), 9 (Teen Wolf), 10 (Necessary Roughness), 11 (Any Given Sunday).